What is the KU Policy Library? The KU Policy Library is the official repository for all policies at the University of Kansas. By having the policies stored and made available in one online location it becomes easier for users to find the information they need. In addition to this, links to the policies and policy-related documents become easier to maintain. The Policy Office encourages units to have contributors who can edit and add policies for their individual units and departments. Submit your request for contributor access to the Policy Library via our online form. Open your web browser and navigate to policy.ku.edu. 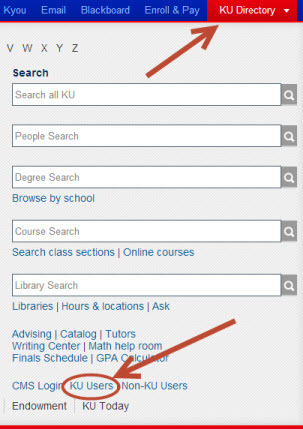 Log into the Content Management System (CMS) by clicking on the red KU Directory link at the top right of the page. At the bottom right of the box that appears, select “KU Users”. As you begin to draft your policy, it is helpful to use the Policy Development Template as a guide.The Word template has been designed to closely match the order and the content fields of the online policy entry form. Once your policy content has been finalized and the draft has gone through the appropriate review processes, vetting by stakeholders, and final approval (see Policy Development Process), you will be able to easily transfer the policy content from your draft straight into the Policy Library via the policy entry form.